There was never supposed to be a protectorate. Or at least the bey of Tunis did not think so. After all, he already had a protector in the Ottoman sultan-albeit one from whom he had long asserted his independence and whose ability to protect any of his regents had been compromised by the Crimean War and its aftermath. In part because of that war (and the cost of raising a Tunisian army raised in defense of the Ottomans), Muhammad al-Sadiq Bey had found his finances under international receivership for over a decade. Nonetheless, he clung to what remained of his autonomy.1 In fact, the bey was caught between two imperial systems that clashed in the late-nineteenth-century Mediterranean: the Ottoman Empire and the New Imperialism. Claiming autonomy from the Ottoman sultan, the beys had cultivated relationships with Western European governments and their consular representatives for decades, even negotiating separate capitulations treaties with them.2 Similar to agreements by the same name that the Ottoman sultan had entered into with European states in other parts of the empire, these treaties granted European governments the right to judge their subjects under their own laws and thereby avoid their subjection to Islamic law, which was perceived to be prejudicial.3 By brokering these arrangements, the bey had deliberately sought the support of European powers as counterweights to the sultan. In the late nineteenth century, however, as Western powers scrambled to divvy up the African continent in a "new" phase of imperial acquisition, older forms of empire such as Ottoman suzerainty began to look more attractive to the bey.4 The trouble was that the sultan, like the bey, increasingly confronted challenges from those same Western European powers and struggled himself to maintain control of his many provinces. In an effort to capitalize on these dynamics, French leaders had tried to convince Muhammad al-Sadiq Bey that the Ottoman sultan was scheming to install a pasha in Tunis, as had been done in Tripoli. Arguing that the bey's independence would be better safeguarded by France, the Quai-d'Orsay had offered to "protect" the bey in February 1881. In reply, the bey repudiated the charges and declined the offer as unnecessary.5 Later that spring, when the French used the Khmirs' activities on the Tunisia-Algeria border as an excuse for intervention, the bey protested French military encroachment on his territory, even sending his own troops to try to quiet the Khmirs himself.6 But nothing he did could satisfy the French, who forced his hand on 12 May; the resulting Treaty of Ksar Said (Bardo Treaty) established the protectorate without mentioning the word. The Tunisian crisis accompanied the dawning of the "Age of Empire" or the "New Imperialism," in which the acquisition of colonial territory was viewed as a zero-sum game, where one nation's gain was another's loss. In North Africa, this territorial competition helped set in motion the gradual dismemberment of the Ottoman Empire.9 Yet, as the case of Tunisia exemplifies, this game was played not only on a purely geopolitical level, with sparring over boundary lines on a map. It was also about human beings and the boundaries of their allegiances. That this was so explains why Italy and Great Britain, both of which had substantial subject populations in Tunisia, were more exercised than other European powers about France's establishment of a protectorate. Yet alongside this early phase in the "Age of Empire" coexisted the notion of a "Concert of Europe." Whatever their misgivings, neither Italy nor Great Britain found France's conquest of Tunisia worthy of upsetting European peace. Nor, evidently, did the Ottoman sultan, who, confronted at the same time with Western European powers encroaching on territory closer to his imperial center, did not raise an army to defend Tunisia-partly because France threatened him with war if he did.10 Nonetheless, even as Western European powers acquiesced to the expansion of territory falling under France's influence, they remained concerned about what the conquest meant for their ability to defend their commercial interests and the rights of their own subjects or citizens who lived there, as well as what impact it would have on international relations in the Mediterranean more generally. Once the protectorate over Tunisia was a fait accompli,France's imperial rivals quickly became invested in ensuring that it never became an annexed colony. To this end, they defended a set of premises they saw as distinguishing the protectorate form of governance from outright annexation: first and foremost, the maintenance of the bey's sovereignty and the recognition of the beylical state in international law and, second, as a corollary, the continued recognition of all treaties and agreements the bey's government had hitherto negotiated with foreign powers. France's imperial rivals thus became staunch defenders of beylical sovereignty, since their own rights and those of their subjects hinged on his. The ongoing impact of the bey's treaties with a variety of European nations, particularly Italy and Great Britain, was manifest in countless dimensions of Tunisian life-from property rights and taxation to criminal and civil law-and so ensued incessant jockeying with regard to issues large and small. This everyday maneuvering by residents of Tunisia will be examined in detail in the following chapters, but in order to understand how and why such behavior could affect Mediterranean politics more generally, it is worth considering the state of that politics at the time the protectorate was established, as well as what this form of governance meant for France, the bey, and the European governments maintaining interests in Tunisia. When France launched an invasion of Tunisia in April 1881, the stated casus belli was the threat posed by the activity of the Khmir tribe of northwest Tunisia to France's colony in Algeria.11 At the outset, the French government pledged to begin its expedition on the French side of the Algeria-Tunisia border, which French soldiers would cross only if "military operations required it." As the British ambassador to France recalled his conversations with the French foreign minister, Jules Barthélemy-Saint-Hilaire, the latter had spoken "of the operations as if they would be confined to the neighbourhood of the frontier, and . . . directed only to the punishment of the lawless frontier tribes. "12 But as the invasion quickly extended beyond Khmir lands, Muhammad al-Sadiq wrote to inform the French that he regarded the invasion as "contrary to the rules of international law. "13 Several days later, he made his second plea for foreign aid in two weeks. In his letter to the British and Italian foreign ministers, he complained that instead of merely punishing the Khmirs, as the Quai-d'Orsay had continually promised both the bey and Europe was its sole intention, French troops had continued on to Le Kef, which they occupied, were marching on Béja, and had destroyed and occupied the forts at Tabarca. (See Map 1 in the Introduction.) A French garrison had even been stationed in the port of Bizerte, "on whose citadel," he protested, "the French colors fly." Under these circumstances, and claiming that he had tried to convince the French government of his good graces, the bey continued, "I leave my fate and that of my country in your hands and those of my Suzerain [the Ottoman Sultan] . . . to take whatever measures of mediation will stop the scourge of war experienced by the peaceful inhabitants of my Regency. "14 Muhammad al-Sadiq's invocation of the sultan's protection was consistent with the Husaynid beys' tendency to draw on their relationship to the Porte for legitimacy when necessary.15 But with the sultan also weakened vis-à-vis Western Europe, this proved a rather futile gesture. The matter was of concern because the foreign secretary in 1881, Lord Granville, "had no wish to see France get an 'overwhelming preponderance in the Mediterranean. '"20 More specifically, Lord Granville contended that "any measures which would affect the existing state of the African provinces on the Mediterranean could not be matter of indifference to the European Powers, many of whom, like Great Britain, have special Treaties with Tunis, entitling them to most-favoured-nation treatment in the Regency. "21 Tunisia itself was therefore less important to the British than what it symbolized: French control of the narrowest part of the Mediterranean after Gibraltar and of territory stretching from Algeria to the border of Tripolitania. And yet, despite these concerns, when the Ottoman sultan complained of the French invasion, the British prime minister, William Gladstone, told him that maintaining "the Concert of Europe" was his first priority.22 The interest in the "concert" also meant that Britain rebuffed Italian suggestions that they respond together to check the French advance in Tunisia; it simply was not worth the risk of alienating France. Britain was not playing a double game so much as it was trying to balance many different interests, including its own designs on Egypt. As the Quai-d'Orsay saw it, since "all of Europe knew" that French designs had not been limited to the chastisement of the Khmirs, this hand-wringing on the part of Britain and Italy was disingenuous.30 The day after concluding the Bardo Treaty, Barthélemy-Saint-Hilaire informed the French diplomatic corps-but not "all of Europe"-that France's objective always had been to "render impossible in the future any reprise of such acts of barbarity." The establishment of the protectorate would, in his view, guarantee that.31 By "barbarity," Barthélemy-Saint-Hilaire was referring to the killing of some French soldiers during Khmir incursions across the Algerian border in April. But this was hyperbole, since the few hundred forays made by Khmirs in the past year did not prove their "barbarity" so much as their irreverence toward a border they regarded as arbitrary and their willingness to defend themselves against Frenchmaneuvers. Whatever assurances the French foreign minister had given the bey and European powers about the limited scope of the invasion in the past, he now retroactively suggested that no one should be surprised by the advent of the protectorate. Of course, he was partly right: France's interest in Tunisia was hardly spontaneous. The impetus for French imperial expansion throughout North Africa considerably predated the 1880s, as France had long been concerned to protect its position in Algeria, where a state of rebellion continued on and off for decades following the 1830 invasion. At mid-century, as Julia Clancy-Smith has shown, the increasing reliance of Algerian rebels on Tunisian support had brought the French to intervene more directly on the Tunisian-Algerian border. Indeed, according to Clancy-Smith, "Tunisia's open-door policy toward Algerian émigrés was one element, among several, that eventually brought its forced incorporation into France's expanding empire. "32 That being the case, why not simply annex Tunisia to Algeria? This was what the European powers, once faced with the fact of the protectorate, were determined to prevent. Of all Barthélemy-Saint-Hilaire's preinvasion promises to the bey and the European powers, the one he and his successors kept was that France would not annex Tunisia. As already suggested, this was due to both self-interest and international politics. The Bardo Treaty, which had established the protectorate without calling it one, was a carefully crafted compromise. In exchange for the bey's consent that the French "military authority would occupy all areas deemed necessary for the reestablishment of order and security of both borders and coastline," the French government agreed to protect the bey's dynasty and to guarantee all preexisting international agreements between the bey's government and other powers. In this way, France recognized, tacitly, both the bey's sovereignty and the interests of other governments in Tunisia-most notably those of Italy and Britain.33 Specifically, the treaty provided, in Article IV, that the French government would "guarantee the execution of existing treaties between the Government of the Regency and diverse European powers. "34 For both Great Britain and Italy, Article IV became an article of faith, invoked repeatedly over the course of their subsequent relations with France in Tunisia. The other main guarantee was the "most-favored nation" status that treaty beneficiaries were granted with regard to duties on commerce and virtually any matter implying a fiscal obligation to the bey on the part of Europeans. European governments guarded these very jealously, even though Tunisia never became a trading powerhouse to the extent that some other European colonies did. There were fishing and navigation rights to be protected, as well as exemptions from duties for both export commodities (e.g., esparto/alfa grass, phosphates, dates, olives, grapes) and imports of finished products from Europe.38 Most-favored nation status and exemption from native justice were the pillars of European prestige in Tunisia, and they were what European powers continually insisted were guaranteed by the recognition of beylical sovereignty that was built into the protectorate system. No wonder, then, that the British and Italian governments became staunch defenders of the bey's independence.39 Although foreign consuls had long since ceased honoring the bey by kissing his hand, they defended his autonomy in the wake of the Bardo Treaty by insisting that their independent relationships with him should be guarded from French interference. Their own prestige was intimately intertwined with that of the bey.40 If his power waned, so might theirs. Raybaudi Massiglia's dispatches were prescient in some ways and exaggerated in others. He rightly ascertained that the French government would seek to reform Tunisia's internal as well as external affairs, though local government would not, in fact, be abandoned. Yet even if it was in some ways true that the bey had already abdicated a great deal of authority in allowing Roustan to represent him, French authorities still did not have free rein in the protectorate. The Bardo Treaty, which Raybaudi Massiglia had pronounced dead in May 1882, actually formed the basis for Italy's ongoing influence in Tunisia for many years to come. Indeed, France's first order of business after forcing the bey to sign the Bardo Treaty and putting down major rebellions in Sfax, Kairouan, and Gabès was not to undermine the bey's power so much as to end the extraterritorial sovereignty of European governments. Such an endeavor turned out to be much more difficult than French leaders had anticipated. 1 Tunisia's finances had been controlled by an International Finance Commission made up of Great Britain, Italy, and France since 1869. 2 On the bey's relations with Western powers, see esp. L. Carl Brown, The Tunisia of Ahmed Bey, 1837-1855 (Princeton, NJ: Princeton University Press, 1974), esp. ch. 7, "Tunisia and an Encroaching Outside World"; Christian Windler, La diplomatie comme experience de l'autre: consuls francais au Maghreb (1700-1840) (Geneva: Droz, 2002); Julia Clancy-Smith, Mediterraneans, esp. chs. 1 and 6. 3 Except in some real property disputes, since real property remained under Islamic jurisdiction unless both parties to a dispute were European. 4 The bey had vacillated between cultivating the support of European powers and that of the sultan for some time. As François Arnoulet notes, the structure of the Ottoman Empire "allowed the Tunisian government to negotiate on equal footing with other powers, but, whenever these powers appeared too demanding, also gave it the possibility to evade responding by falling back on the Ottoman government." Arnoulet, "Le rapports tuniso-ottomans de 1848 à 1881 d'après les documents diplomatiques," Revue de l'Occident Musulman et de la Méditerranée 47 (1988): 144. See also Kenneth Perkins, "'The masses look ardently to Istanbul': Tunisia, Islam, and the Ottoman Empire, 1837-1931," in John Ruedy, ed., Islamism and Secularism in North Africa (Basingstoke, England: Macmillan, 1994), 23-36. 5 See copy beylical correspondence in British National Archives (BNA) FO 881/4470: Correspondence Respecting Tunis (Foreign Office, 18 July 1881), 16. I have been unable to locate these particular letters from the bey in French or Tunisian archives, hence my reliance on their copies in the British Foreign Office records. February 1881 was not the first time France had suggested protection. See Brown, Tunisia of Ahmed Bey, 254. 6 Although some historians question how sincere an effort this was on the bey's part. See esp. 'Abd al-Jalil Tamimi, Al-Jaysh al-Tūnisī fī 'Ahd Muhammad al-Sadiq Bay 1859-1882 (Sfax, Tunisia: University of Sfax, 1995), esp. 214. Thank you to Ali Asgar Alibhai for assisting in the translation of this source. 7 BNA FO 881/4470: Lord Granville's recollection of conversation with Léon Say, 12 June 1880, as recorded in Correspondence Respecting Tunis (Foreign Office, 18 July 1881), 16; see also similar remark in Lord Granville to Lord Lyons, 7 May 1881, in ibid., 20. This remark is often interpreted as Britain offering France free rein in Tunisia, but if viewed in context, it more likely means that the British foreign office did not mind France taking responsibility for some of the role they had traditionally played in Tunis via their consul. Given Britain's interest in keeping the Ottoman Empire intact-the better to counter its rival Russia-this remark cannot be interpreted as a green light to France to begin dismembering the Ottoman Empire. 8 Annales de la Chambre des Députés, Session Extraordinaire, Séance du jeudi 1 Décembre 1881. 9 The "Age of Empire" is something of a misnomer, since it implies there was only one. The Mediterranean had been the site of imperial struggles in many different "ages," including, of course, Classical Antiquity. In North Africa in particular, the "Age of Empire" as understood here meant more precisely the age of Western European imperialism at the expense of older forms of empire such as that of the Ottomans. For an elaboration on the characteristics of this "age," see Eric Hobsbawm, The Age of Empire, 1875-1914 (New York: Pantheon Books, 1987). In noting the relationship between Western imperial ascendancy and the "Eastern Question," I do not in any way mean to suggest that the dissolution of the Ottoman Empire was inevitable. 10 The Ottoman Grand Vizir Said Pacha and his minister Assim Pacha considered sending a squadron to the Tunisian coast, not so much to fight the French but to serve as a display of Turkish sovereignty; in response, the Quai-d'Orsay informed the sultan that any departure of warships from the Dardanelles would be considered an act of war toward France. See Arnoulet, "Les rapports tuniso-ottomans," 150. Among the encroachments on Ottoman territory that the sultan was facing at roughly the same time was, of course, was Austria-Hungary's assumption of control over Bosnia and Herzegovina in 1878. 11 Daniel Rivet has called this a "minuscule casus belli." Rivet, Le Maghreb à l'épreuve de la colonisation (Paris: Hachette Littératures, 2002), 153. 12 BNA FO 881/4470: Assurances provided to the British Foreign Office by Barthélemy-Saint-Hilaire, as recalled by Lord Lyons (Richard Bickerton Pemell Lyons), in Correspondence Respecting Tunis (Foreign Office, July 18, 1881), 17. 13 Traduction d'une lettre de son altesee le bey au chargé d'affaires de la république française a Tunis, 26 Djoumad 1er 1298 (25 April1881). In Ministère des Affaires Étrangères, Documents Diplomatiques: Affaires de Tunisie. Supplément. Avril-Mai 1881. (Paris: Imprimerie Nationale, 1881), Annexe au no. 237, page 9. See also similar complaint from bey to French chargé d'affaires dated 11 Djoumada Ettania 1298 (9 May 1881), in ibid., Annexe au no. 264, 34-35. 14 Letter from his highness the bey of Tunis to George Leveson Gower Granville (the second Earl of Granville), the British foreign secretary, and Benedetto Cairoli, the Italian premier and foreign minister, 4 May 1881. In Ministère des Affaires Étrangères, Documents Diplomatiques: Affaires de Tunisie. Supplément. Avril-Mai 1881. (Paris: Imprimerie Nationale, 1881), Annexe au no. 248, 24-25. 15 On this point, see Arnoulet, "Le rapports tuniso-ottomans"; Perkins, "'The masses look ardently'"; Clancy-Smith, Mediterraneans, 47. 16 Benedetto Cairoli in Luigi Chiala, Pagine di storia contemporanea, vol. 2, Tunisi (Turin, Italy: Roux Frassati e c., 1892-98), 110. Lord Salisbury was the third Marquess of Salisbury, Robert Arthur Talbot Gascoyne-Cecil. The Cyprus agreement had been arranged in secret in the days preceding the congress. 17 BNA FO 881/4470: Waddington to the Marquis d'Harcourt (French ambassador to London), 26 July 1878; and Salisbury reaction in communication to Lord Lyons, 7 August 1878, in Correspondence Respecting Tunis (Foreign Office, July 18, 1881), 14-15. For a reproduction of Waddington's full dispatch in the original French, see Luigi Chiala, Pagine di storia contemporanea, vol. 2, Tunisi, 124-26. Political historians generally agree that discussions occurring at the Berlin Congress helped pave the way to France claiming Tunisia, though they disagree on the extent to which Britain overtly endorsed the idea. For an account downplaying Britain's endorsement, see Arthur Marsden, British Diplomacy and Tunis, 1875-1902: A Case Study in Mediterranean Policy (New York: Africana Publishing, 1971); for an account from the French perspective, see Jean Ganiage, Les origines du protectorat français en Tunisie (1861-1881) (Paris: Presses universitaires de France, 1959). 18 See, e.g., BNA FO 881/4470: Correspondence Respecting Tunis (Foreign Office, 18 July 1881), 19-20. As François Arnoulet has noted, France had historically supported the notion that Tunisia was an "independent" country that was tied to the Ottoman sultan only by virtue of religious ties, whereas Britain had regarded Tunisia as no more than a province of the Ottoman Empire. Arnoulet, "Les Rapports tuniso-ottomans," 143-52. Britain had opposed earlier threats of French intervention but had also opposed a more overt Turkish presence in the Regency (Arnoulet, 144). 19 BNA FO 881/4470: Lord Granville to Lord Lyons, 7 May 1881, in Correspondence Respecting Tunis (Foreign Office, 18 July 1881), 20. 20 Lord Granville, cited in Arthur Marsden, British Diplomacy and Tunis, 74. In fact, the British consul in Tunis (1855-79), Sir Richard Wood, had been priming the Foreign Office to be concerned about this since his arrival there in 1855. Already in 1859 he warned that a French invasion of Tunisia would allow France to control the passage between the Western and Eastern Mediterranean, and also would "neutralize Malta," the British crown colony that served as an important base for the British navy. Ganiage, Origines, 37; also Ibrahim Chaman, "'An Ottoman' Sir Wood in Tunis: The Man, Diplomacy, and Politics," Revue d'histoire maghrébine 29, 105 (January 2002): 69-78. 21 BNA FO 881/4470: Lord Granville to Lord Lyons, 7 May 1881, in Correspondence Respecting Tunis (Foreign Office, 18 July 1881), 20. 22 BNA FO 881/4470: Correspondence Respecting Tunis (Foreign Office, 18 July 1881), 19. 23 For figures, see Paul Sebag, La Tunisie: Essai de Monographie (Paris: Éditions Sociales, 1951), 144; also Richard A. Macken, "The Indigenous Reaction to the French Protectorate in Tunisia, 1881-1900" (PhD diss., Princeton, 1972), 123. These are conservative figures. The numbers are very difficult to establish and vary from source to source. A petition from the Maltese in 1883 asserted there were sixteen thousand Maltese alone, probably an exaggerated figure. See BNA FO 335/159. Others estimated the total number of non-French Europeans at closer to forty or fifty thousand. See, for instance, the speech of Jules Delafosse in the Chamber of Deputies, 17 July 1882, Annales, 919. 24 Often attributed to the French economist Paul Leroy-Beaulieu. I have not found an exact match to this quote in Leroy-Beaulieu's work; however, it fits the tone of his view on Italy's role in Tunisia. In L'Algérie et la Tunisie, Leroy-Beaulieu writes that France should be careful it "does not hatch an Italian egg in Tunisia." Paul Leroy-Beaulieu, L'Algérie et la Tunisie, 2nd ed. (Paris: Guillaumin et cie, 1897), 571. 25 Cairoli was not ignorant of the concerns (he had declared in parliament in 1880 that Italy had political as well as economic interests in Tunisia), but he was not moved to act, perhaps in part due to French assurances. 26 William L. Langer, "The European Powers and the French Occupation of Tunis, 1878-1881-II," American Historical Review 31, 2 (January 1926): 255. 27 Saverio Cilibrizzi, Storia parlamentare politica e diplomatica d'Italia, da Novara a Vittorio Veneto, vol. 2, 1870-1896 (Milan, Rome, Naples: Albrighi, Segati & C., 1925), 204 and 212. Scholarship on Italy's "natural" role in Tunisia mushroomed during the fascist era. For an interesting account of the formation of Italian identity abroad, including in Tunisia, see Mark Choate, Emigrant Nation: The Making of Italy Abroad (Cambridge, MA: Harvard University Press, 2008). 28 Lord Granville to M. Challemel-Lacour, 20 May 1881. In Ministère des Affaires Étrangères, Documents Diplomatiques: Affaires de Tunisie. Supplément. Avril-Mai 1881 (Paris: Imprimerie Nationale, 1881), no. 285, 57-58. 29 Museo Centrale del Risorgimento a Roma (hereinafter MCRR), Carte di Pasquale Stanislao Mancini, Busta 649, fasc. 11, foglio 3: Pasquale Mancini, telegram to Maccio, 1 June 1881, 6:15 P.M. 30 M. Barthélemy-Saint-Hilaire, Ministre des Affaires étrangères, aux Agents diplomatiques de la République française, 13 May 1881. In Ministère des Affaires Étrangères, Documents Diplomatiques: Affaires de Tunisie. Supplément. Avril-Mai 1881 (Paris: Imprimerie Nationale, 1881), no. 276, 45. Certainly, the possibility of complete occupation was debated within French circles from the very beginning; for instance, see François Arnoulet on behind-the-scenes discussions from as early as 19 April 1881. Arnoulet, "A propos des événements de 1881 en Tunisie: Le dilemme français entre les deux operations (Mai-Juillet 1881)," Revue d'histoire maghrébine 29, 107-8 (June 2002): 9-19.c 31 Ibid. 32 Clancy-Smith, Rebel and Saint, 8, 258; see also ch. 6. 33 Traité entre le gouvernement de la République française et le Bey de Tunis, 12 Mai 1881. In Ministère des Affaires Étrangères, Documents Diplomatiques. Affaires de Tunisie. Supplément, Avril-Mai 1881 (Paris: Imprimérie Nationale, 1881), 38-40. 34 Ibid. 35 On the capitulations generally, see H. Inalcik et al., "Imtiyāzāt," in Encyclopaedia of Islam, online edition, ed. P. Bearman et al., Second Edition (Leiden: Brill, 2005), http://referenceworks.brillonline.com/entries/encyclopaedia-of-islam-2/imtiyazat-COM_0371. (Content available with subscription or purchase.) For a longer discussion of this process in Tunisia, see Mary Dewhurst Lewis, "Geographies of Power." Although Morocco was never part of the Ottoman Empire, it faced similar problems. See Mohamed Kenbib, Les Protégés: Contribution à l'histoire contemporaine du Maroc. Préface de Daniel Rivet. Theses et memoires no. 29 (Rabat: Faculté des lettres et des sciences humaines, 1996); Edmund Burke III, Prelude to Protectorate: Precolonial Protest and Resistance, 1860-1912 (Chicago: University of Chicago Press, 1976), esp. ch. 2, "Morocco and the West, 1860-1900"; C.R. Pennell, "The British Consular Courts and Moroccan Muslim Identity: 'Christian' Justice as a Tool," Journal of North African Studies 1, 2 (1996): 172-91; idem, "Law on a Wild Frontier: Moroccans in the Spanish Courts in Melilla in the Nineteenth Century," Journal of North African Studies 7, 3 (2002): 67-78. For the more general problem of encroaching extraterritorial claims in Ottoman lands, see Ferroz Ahmad, "Ottoman Perceptions of the Capitulations, 1800-1914," Journal of Islamic Studies 11, 1 (2000): 1-20; John Spagnolo, "Portents of Empire in Britain's Ottoman Extraterritorial Jurisdiction," Middle Eastern Studies 27, 2 (April 1991): 256-82; Salahi R. Sonyel, "The Protégé System in the Ottoman Empire," Journal of Islamic Studies 2, 1 (1991): 56-66; and June Starr, "When Empires Meet: European Trade and Ottoman Law," in Mindie Lazarus-Black and Susan F. Hirsch, eds., Contested States: Law, Hegemony and Resistance (New York and London: Routledge, 1994), 231-51. 36 BNA FO 881/4446: Order in Council, at the court a Windsor, 18th day of May, 1881 (published in London Gazette, 20 May 1881). 37 For the interpretation of extraterritoriality as a form of imperialism, see Eileen P. Scully, Bargaining with the State from Afar: American Citizenship in Treaty Port China, 1844-1942 (New York: Columbia University Press, 2001), esp. 8-13, 71; Richard S. Horowitz, "International Law and State Transformation in China, Siam, and the Ottoman Empire during the Nineteenth Century," Journal of World History 15, 4 (2004): 445-86; Spagnolo, "Portents of Empire"; and Ruskola, "Canton Is Not Boston." 38 Esparto (or alfa) grass is used in papermaking. The British were said to have a "practical monopoly" on this trade in Tunisia. Marsden, British Diplomacy, 86. 39 This, of course, was a reversal for the British from their earlier position of viewing the bey as a mere vassal of the Ottoman sultan; prior to the advent of the protectorate, it had been the French who had emphasized the bey's independence vis-à-vis the sultan; now it was Britain that emphasized this vis-à-vis the French. See Arnoulet, "Les Rapports tuniso-ottomans," passim. 40 On the cessation of hand-kissing, see L. Carl Brown, The Tunisia of Ahmad Bey, 9, 232; on this tradition as practiced earlier, see Windler, Diplomatie, 432-38. On the relationship between the beys and European powers more generally, see Windler, Diplomatie, passim and esp. 224-30, 266-77. 41 MCRR Carte di Pasquale Stanislao Mancini, Busta 649, fasc. 11, foglio 6: Il rappresentante della repubblica francese al regio agente e console generale d'Italia, 9 June 1881. Annexed to dispatch, Il R. Agente e Console generale in Tunisi al Ministro degli affari esteri, 10 June 1881. Received 15 June 1881. 42 MCRR Carte di Pasquale Stanislao Mancini, Busta 649, fasc. 11, foglio 4: Telegram from Maccio, 9 June 1881, sent 5 P.M., arrived 9:40 P.M. 43 MCRR Carte di Pasquale Stanislao Mancini, Busta 649, fasc. 11, foglio 8. Handwritten note. 44 BNA FO 881/4470: Lord Granville to Lord Lyons, 22 May 1881, in Correspondence Respecting Tunis (Foreign Office, July 18, 1881), 26. See also MCRR Carte di Pasquale Stanislao Mancini, Busta 650, fasc. 6, foglio 7: General Menabrea's (Federico Luigi, Conte di Menabrea) recollection of conversation with Lord Tenterden, permanent foreign office undersecretary, reported in Il R. Ambasciatore in Londra al Ministro degli Affari Esteri, 4 August 1881. 45 BNA FO 881/4470: Lord Granville to Lord Lyons, 22 May 1881, in Correspondence Respecting Tunis (Foreign Office, 18 July 1881), 26. 46 MCRR Carte di Pasquale Stanislao Mancini, Busta 650, fasc. 6, foglio 7: Il R. Ambasciatore in Londra al Ministro degli Affari Esteri, 4 August 1881. In his analysis of indirect rule in India, Michael Fisher notes that the British "residency system" proved influential not only to other British imperial endeavors outside India but also to other imperial powers, who, when adopting an "indirect" style of rule, invariably also adopted the title "Resident" for the agent of that rule. See Michael H. Fisher, Indirect Rule in India: Residents and the Residency System, 1764-1858 (Delhi and New York: Oxford University Press, 1991), esp. ch. 1. 47 MCRR Carte di Pasquale Stanislao Mancini, Busta 650, fasc. 6 foglio 10: Il R. Ambasciatore in Londra al Ministro degli Affari Esteri. Confidenziale. 23 August 1881. Ambassador Menabrea, of course, meant Austria-Hungary, not Austria alone. 48 BNA FO 881/4470: Lord Granville to Lord Lyons, 22 May 1881, in Correspondence Respecting Tunis (Foreign Office, 18 July 1881), 26-27. 49 MCRR Carte di Pasquale Stanislao Mancini, Busta 650, fasc. 6, foglio 5: Il R. Agente e Console generale in Tunisi al Ministro degli affari esteri, 12 July 1881. Emphasis in original. 50 MCRR Carte di Pasquale Stanislao Mancini, Busta 650, fasc. 6, foglio 11: Il Ministro degli affari esteri al reggente l'agenzia e consolato generale in Tunisi, 31 August 1881. 51 "La Francia a Tunisi," Il Diritto. Giornale della democrazia italiana, (14 August 1881), 1. 52 MCRR Carte di Pasquale Stanislao Mancini, Busta 650, fasc. 11, foglio 17: Translation of Raybaudi Massiglia's message to bey, in telegram to Pasquale Mancini, sent 12 October 1881. Justifying his decision to the Italian foreign minister, Raybaudi Massiglia wrote that his action had met the approval of Italians living in Tunis and that the British consul, Thomas F. Reade, hoped to follow suit. MCRR Carte di Pasquale Stanislao Mancini, Busta 649, fasc. 11, foglii 12 and 13: Mancini to Raybaudi Massiglia, encrypted telegram no. 901, 10 October 1881, 5:30 P.M.; and Raybaudi Massiglia's response, telegram no. 1565, 11 October 1881, 11:25 A.M., arrived 12:20 P.M. 53 MCRR Carte di Pasquale Stanislao Mancini, Busta 649, fasc. 11, foglio 15: Raybaudi Massiglia to Mancini, telegram no. 1570, 11 October, sent 9:30 A.M., arrived 5:30 P.M. 54 MCRR Carte di Pasquale Stanislao Mancini, Busta 650, fasc. 6, foglii 16 and 17: Il Reggente l'agenzia e consolato generale in Tunisi al Ministro degli affari esteri, 17 February 1882; and Mancini's reply, 24 February 1882. 55 Archivio Storico Diplomatico (hereafter ASD), Documenti diplomatici (hereafter DD) (1882), no. 898 (IX): Il reggente l'agenzia e consolato generale in Tunisi al ministro degli affari esteri. Tunisi, 6 November 1882. 56 ASD DD (1882), no. 827 (IX): Il Reggente l'Agenzia e Consolato Generale in Tunisi al Ministro degli affari Esteri. Tunisi, 12 May 1882. Received 16 May 1882. Italics in original. 57Ibid. According to Cambon's son, the decision by Cambon to present the foreign consuls to the bey was deliberately aimed to clarify any "ambiguity" (équivoque) with regard to the "new state of affairs." Henri Cambon, Paul Cambon: Ambassadeur de France (1843-1924) (Paris: Librairie Plon, 1937), 56. After invading Tunisia in 1881, the French installed a protectorate in which they shared power with the Tunisian ruling dynasty and, due to the dynasty’s treaties with other European powers, with some of their imperial rivals. This “indirect” form of colonization was intended to prevent the violent clashes marking France’s outright annexation of neighboring Algeria. 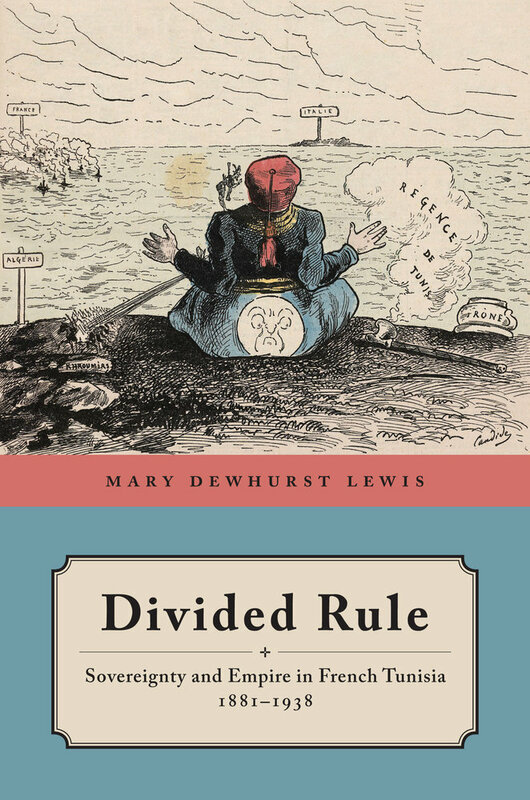 But as Mary Dewhurst Lewis shows in Divided Rule, France’s method of governance in Tunisia actually created a whole new set of conflicts. In one of the most dynamic crossroads of the Mediterranean world, residents of Tunisia— whether Muslim, Jewish, or Christian—navigated through the competing power structures to further their civil rights and individual interests and often thwarted the aims of the French state in the process. Over time, these everyday challenges to colonial authority led France to institute reforms that slowly undermined Tunisian sovereignty and replaced it with a more heavy-handed form of rule—a move also intended to ward off France's European rivals, who still sought influence in Tunisia. In so doing, the French inadvertently encouraged a powerful backlash with major historical consequences, as Tunisians developed one of the earliest and most successful nationalist movements in the French empire. Based on archival research in four countries, Lewis uncovers important links between international power politics and everyday matters of rights, identity, and resistance to colonial authority, while re-interpreting the whole arc of French rule in Tunisia from the 1880s to the mid-20th century. Scholars, students, and anyone interested in the history of politics and rights in North Africa, or in the nature of imperialism more generally, will gain a deeper understanding of these issues from this sophisticated study of colonial Tunisia. Mary Dewhurst Lewis is Professor of History at Harvard and author of The Boundaries of the Republic: Migrant Rights and the Limits of Universalism in France, 1918-1940 (Stanford University Press, 2007).